Villa Prumiano is a small hamlet, set in a charming and panoramic position, immersed in the vineyards of the Chianti countryside. 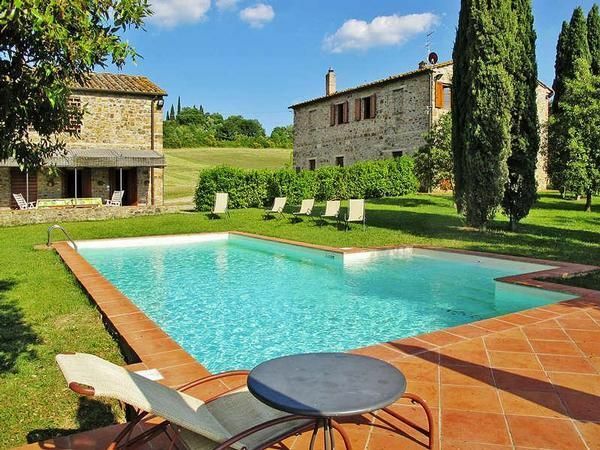 The property is located halfway between Florence (30 km) and Siena (40 m). At 5 km from the medieval town of Barberino Val d'Elsa, the town of Tavarnelle Val di Pesa, the medieval town of San Donato in Poggio, Poggibonsi, where you can find shops of all kinds. Pleasant and well organized outdoor areas at the guests' disposal. Near the hayloft you will find the swimming pool(5x12) and below it is a changing room with a laundry area (washing machine). Access to the house along 1 km of country road. Pool is open 16-30 April until 1-10 October, depends on the weather. .
Furnishings are comfortable and of excellent quality and partly made up of period pieces. entrance/dining room with fireplace, kitchen (oven, freezer, dishwasher, vacuum cleaner), one double bedroom, one bathroom with shower. large lounge with living area with fireplace/relax, satelliteTV, dining area, one double bedroom, one twin bedded room, one bathroom with shower. Wi-fi. Equipped outdoor area. Farmhouse is a completely independent two floor apartment. On the ground floor a fully functional kitchen with fridge, oven and dishwasher, a double bedroom, a bathroom with bathtub and a large dining room with fireplace. On the first floor it has large lounge with living area with fireplace, dining area, one double bedroom with a beautiful view, one twin bedded room with a beautiful view. The dining room open out onto a patio complete with table, chairs for lingering lunches, dinners and relaxation ....Independent central heating. living/dining area with satellite TV, kitchen (oven, freezer, dishwasher, vacuum cleaner), one twin bedded bedroom, one double bedroom, one bathroom with shower, storage room. one double bedroom with bathroom with shower, one double bedroom with bathroom with bathtub. Equipped outdoor area. Hayloft is a completely independent two floor apartment converted from an old barn. On the ground floor a fully functional kitchen with fridge, oven and dishwasher with a beautiful view, a double bedroom with a beautiful view, a bedroom with two single beds, a bathroom with shower and a large sitting room with satellite TV. On the first floor it has a double bedroom with a beautiful view and bathroom with a bathtub , a double bedroom with bathroom with a shower. The kitchen and sitting room open out onto a patio complete with table, chairs for lingering lunches, dinners and relaxation ...Independent central heating. Villa Prumiano Hayloft is equipped for people with disabilities. Intermediate cleaning: per object and day Costs amounting to 15 EUR (optional). Intermediate cleaning (per property and day, included in price 15 EUR).